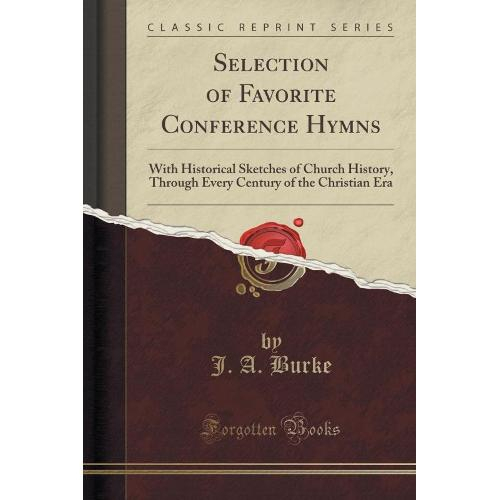 Excerpt From Selection Of Favorite Conference Hymns: With Historical Sketches Of Church Through Every Century Of The Christian Erahymn 2. - 86.The Lord Into His Garden Comes:The Spices Yield A Richthe Lillies Grow Anrefreshing Showrs Of Gracfrom Jesus Flow To Evwhich Makes The Dead Revive.O That This Dry And Barren Groundin Springs Of Water Maa Fruitful Soithe Desert Blossoms As When Jesus Conquers All And Makes His People One.The Glorious Time Is Rothe Gracious Work Is Now Begun:My Soul A Witness Is:I Taste And See The Parfor All Mankind As Wewho Come To Christ The Worst Of Sinners Here May Finda Saviour Pitiful Who Will Them All Receive!None Are Too Late Who Will Repent:Out Of One Sinner Legions Went:Jesus Did Him Relieve.Come Ye Who Love And Taste The Sweetness Of In Jesus Waour Troubles And Our Trials Herewill Only Make Us Richwhen We Arrive At Home.We Feel That Heaven Is Nit Issues From The Shininfrom Jesus Grace On High:It Comes Lik We Cantwe Drink And Drink And Driand Yet We Still Are Dry.But When We Come To Reign Above.About The Publisherforgotten Books Publishes Hundreds Of Thousands Of Rare And Classic Books. Find More At Www.Forgottenbooks.Comthis Book Is A Reproduction Of An Important Historical Work. Forgotten Books Uses State-Of-The-Art Technology To Digitally Reconstruct Preserving The Original Format Whilst Repairing Imperfections Present In The Aged Copy. In Ra An Imperfection In The Such As A Blemish Or Miss May Be Replicated In Our Editio Repair The Vast Majority Of Imperfections Succ Any Imperfections That Remain Are Intentionally Left To Preserve The State Of Such Historical Works.